A professional gardener whose lung filed with pus after inhaling a deadly fungus that lurks in bark and mulch has warned others that they should be careful. People with asthma or a weak immune system are advised to wear masks when moving rotting leaf, plant and tree mulch because of the microscopic dust that this dislodges, which can contain Aspergillus fungal spores. 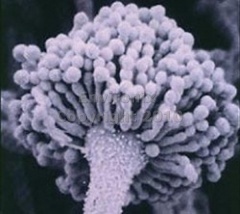 The National Aspergillosis Centre, University Hospital of South Manchester, sees about 350 new patients a year with conditions coming from inhaling the spores. Professor of infectious diseases in global health David Denning said numbers are growing, especially among people who take steroids – arthritis sufferers, for example – which suppress their immune systems.